The daily, two-hour midday show brings major star power to Hispanic radio; encompassing the best in entertainment, trending topics, celebrity gossip, exclusive star interviews, and more. 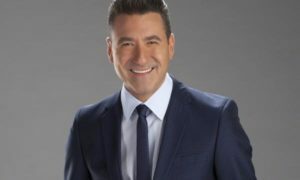 GLR Media Networks announces the hottest new entertainment program for Hispanic radio – Subeme La Radio with Jorge Bernal. The daily, two-hour midday show brings major star power to Hispanic radio; encompassing the best in entertainment, trending topics, celebrity gossip, exclusive star interviews, and more. Its flexible design adjusts easily to fit any Hispanic format, and the full content package includes daily vignettes and a weekend program. ?I am beyond thrilled to be back on the mic, connecting with millions of listeners every single day!? exclaimed Bernal. ?Leveraging my more than 20 years of experience in the entertainment business will allow me to have exclusive content, interviews, and access to today?s hottest artists… hear what?s happening first, way before anyone else.? GLR Media Networks announces the hottest new entertainment program for Hispanic radio - Subeme La Radio with Jorge Bernal A.K.A "Mr. Check It Out".